UPDATE: "The Sword of Damocles hangs over Marsh Fork Elementary School." Video of former US Representative Ken Hechler (D-WV), who introduced the first bill to end mountaintop removal and stripmining in 1971. As a hero to coal miners, Hechler led the campaign for better mining workplace safety and black lung laws and compensation. The 94-year-old Hechler was arrested at the Coal River action, along with coalfield residents and parents, 88-year-old West Virginia activist Winnie Fox, Daryl Hannah, and James Hansen, and Goldman Prize Award winner Judy Bonds, RAN director Michael Brune and many others. UPDATE: 6pm EST. Goldman Prize Award Winner Attacked. 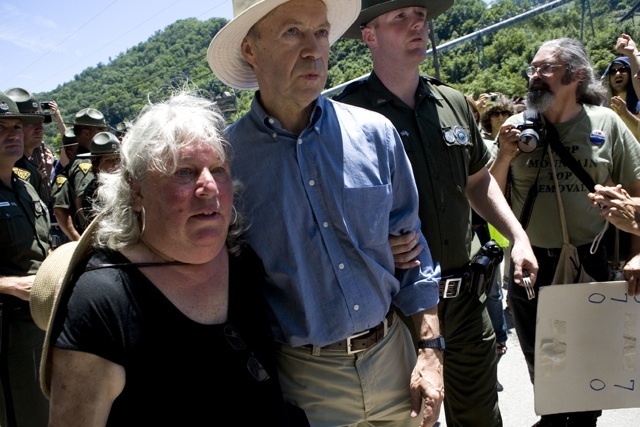 During the rally in front of the Massey Energy coal property today, Coal River Mountain Watch co-director (and 2003 Goldman Prize Award winner) Judy Bonds was reportedly assaulted by a Massey supporter. While Bonds was engaged in a nonviolent protest, the Massey supporter lunged from the line without any provocation and roughly slapped Bonds on the head, ear and jaw. The Massey supporter also attempted an attack on another protestor, Lorelei Scarbro, a coal miner's widow and local community organizer. The Massey supporter was immedidately apprehended by the police and charged with battery, according to news reports. UPDATE: 2:30 EST: 94-year-old Ken Hechler, the legendary West Virginia congressman and coal miner hero who has been battling mountaintop removal since 1971 was arrested in a non-violent protest with NASA's celebrated climate scientist James Hansen, actress Daryl Hannah, Michael Brune, the executive director of Rainforest Action Network, and Goldman Prize winner Judy Bonds. Vietnam veteran Bo Webb, and dozens of other coalfield residents were arrested by crossing onto the property of leading mountaintop removal coal mining company, Massey Energy--purposely trespassing to protest the destruction of mountains immediately above the Coal River Valley community. In the face of recent Obama administration actions to regulate and not abolish mountaintop removal, which has wiped out 500 mountains and destroyed historic communities, the action launched a yearlong national campaign to bring mountaintop removal to an end. In an interview posted on Huffington Post last month, Hechler made a special appeal to President Barack Obama to stand by his word and end mountaintop removal. As a massive turnout of state troopers and hundreds of protesters pour into the Coal River Valley, here is today's scene for the historic nonviolent direct action and march in West Virginia: A 2.8 billion gallon toxic coal sludge impoundment behind the earthen Shumate Dam hovers just a couple of football fields above the Marsh Fork Elementary School, while massive mountaintop removal blasts boom daily within a few feet, and where hundreds of concerned parents, families and citizens from around the country have gathered to call to an end to mountaintop removal--for the sake of the children, the coalfield communities, and the Appalachian mountains. Along with NASA climatologist James Hansen, long-time environmental activist and actress Daryl Hannah, retired coal miner Chuck Nelson, and many other national environmental and political figures, the rally and march from Marsh Fork Elementary School to a Goals Coal Prep Plant and Massey Energy mountaintop removal site will be joined by two legendary West Virginia titans: 88-year-old activist Winnie Fox, and 94-year-old former US Representative Ken Hechler. Over 500 mountains, 1.5 million acres of hardwood forests, and 1,200 miles of streams, along with historic mountain communities, have been destroyed by mountaintop removal. In a study the last fall by the Ashby-Tucker environmental firm, air quality experts found that the coal dust blanketing the Marsh Fork Elementary School exceeded accepted limits. According to the study, Dr. D. Scott Simonton reported: "My concern about the school is that dust levels not only appear to exceed human health reference levels, but that the dust is largely made up of coal. Coal dust contains silica, trace metals, and polynuclear aromatic hydrocarbons (PAH), many of which are known human carcinogens. PAH's have been found in dust samples taken at the school. Inhalation of coal dust is known to cause adverse health effects in humans, however, studies of coal dust toxicity are understandably mostly of adult populations. Children are particularly at risk from dust exposure in general, so it is reasonable to assume that coal dust creates an even greater risk for children than it does adults. The sampling to date certainly indicates that dust levels and composition at the school reach a level of concern. Particulate matter at levels found at the school has been shown to cause adverse effects in children." According to the evacuation plans, if the Shumate Dam and coal sludge impoundment failed--as happened in eastern Kentucky in 2000 and at the TVA coal ash pond--the school children and communities below would have THREE MINUTES to flee. Born in the eastern Kentucky coalfields, Winnie Fox's first protest took place in 1930, when she insisted on drinking from a segregated water foundation in Huntington, West Virginia, where her family moved when she was a child. A former board director of the Ohio Valley Environmental Coalition (ohvec.org)--one of the main organizations in the battle against mountaintop removal--Fox has been involved in stopping reckless pollution in the rivers and watersheds for decades, dating back to her earliest movement against Ashland Oil's pulp mill dumping of toxic material in the waterways. Fox will be in a wheelchair today, but that will not stop her from risking arrest at the coal prep plant and Massey Energy site. In a 2007 interview with Shannon Bell, Fox declared that her battle against mountaintop removal would be a lifelong commitment: "I would never give up, I will never stop. Because to me, that would be betraying everything that I am and everything I've ever been and everything I ever hoped to be. And I've seen too much suffering by these women [who are involved]. Too many sad stories." 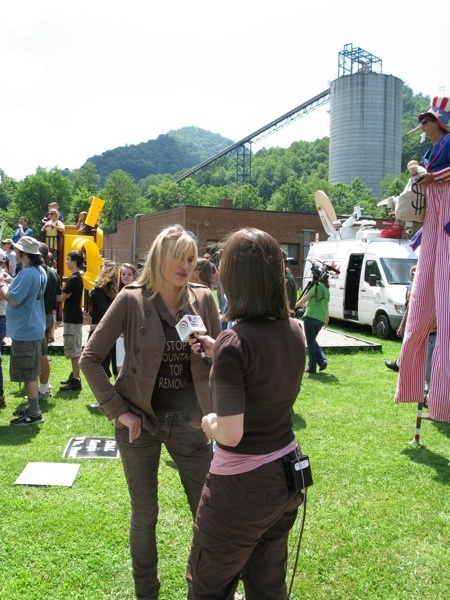 Actress and environmental activist Daryl Hannah will speak at the Educational Rally on Sustainable Solutions for West Virginia at the Marsh Fork Elementary School today. Hannah lives on a solar-powered ranch in the Rocky Mountains in the West. In an interview with the Central Florida Green Guide, Hannah said: "It's a small but beautiful house made with salvaged materials. It's both passive and active solar, meaning it faces southwest. It is beamed into the landscape and uses the natural movement of the sun and the insulation of the earth to heat/cool the structure." Here's a clip from the Sundance Channel about her work for solar energy. Dr. James Hansen, the nation's foremost expert on climate change, will not only risk arrest today, but has agreed to debate Massey Energy CEO Don Blankenship on the reality of climate change. "Stopping coal emissions is 80 percent of the solution to climate change, and halting mountaintop removal is the essential, rational first step," Hansen wrote. "Any politician who claims to support our children and the environment, but also supports mountaintop removal, is either a fool, a liar, or both." 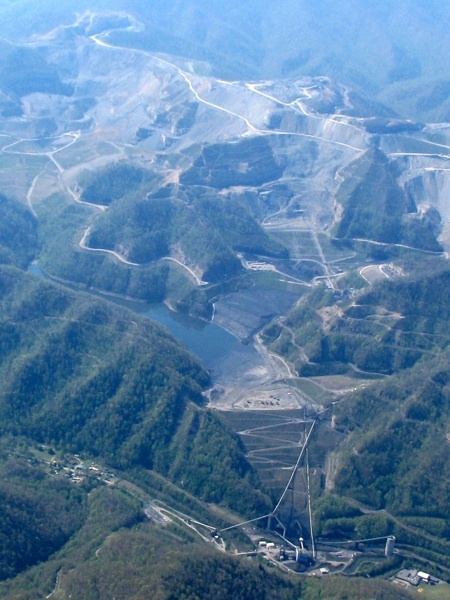 Hansen recently published a piece on Huffington Post on mountaintop removal and his decision to come to Coal River Valley here. And as the rally unfolds today, here's a clip of Marie Gunnoe, the recent Goldman Prize Award winner, whose own home and hollow has been been stripmined, and subjected to flooding seven times, describing the disastrous realities of the coal sludge dam above the elementary school and mountaintop removal blasting. While the rally at Marsh Fork Elementary School and the nonviolent march continues today, it is important to recall a similar moment in West Virginia in 1923, when coal miners went out on strike. Chicago-native Mary "Mother" Jones arrived to support the miners. Her appeal to the West Virginia governor to support striking coal miner is a haunting parallel to today's West Virginia governor Joe Manchin, who has refused to deal with the Marsh Fork Elementary School, despite the health care studies and parent complaints and campaigns. "Governor," I said, Mother Jones wrote in her autobiography,"listen-do you hear anything?" "No, Mother Jones, I do not." "I do," said I. "I hear women and little boys and girls..."
The boys and girls of Marsh Fork Elementary School, and the coalfield communities, along with Americans across the country, are calling on the West Virginia governor, the EPA, the Council for Environmental Quality, and President Barack Obama to listen.